Grandma Plaintiff is a meanie. She doesn’t love me anymore and has told me that I have to start paying my own way in this big old world. I know. I told her it wasn’t fair! Yeah, I showed her my bruised knee that I got when I dived onto the ground to catch you coming down the slide. She told I could find sympathy right there in the dictionary somewhere between a naughty word that you can’t read ( _ H I T) and another naughty word that you should never know ( _yphilis ). I tell you she hates me. I don’t know why you don’t believe me. Sure you see the nice side of her. This side that is always giving you candy… and cake… and sewing nice things for you. And buying you presents (with the money that I earn). And here she is wanting me to earn more money so she can spend more on you probably! I want to spend more money on you too! Honestly I do. I even cut her allowance all the way down to zero so I could have more to buy you pretty dresses and toys with. Did that help? No. She became meaner! Can you believe it???? I have decided that it is time to accept sponsorship to help pay for the web hosting… Actually – I’ve just decided it’s time to promote my part time crafting business… All of our future posts will include a shameless advertisement from our sponsor – mugdoodles.com (www.mugdoodles.com). It also happens that Grandma Plaintiff and I own and operate both MugDoodles.com and Creations101.com. I won’t be posting advertisements for www.Creations101.com however as that is currently her site to maintain and promote while I am the primary driving force behind mugdoodles.com. What? You expected to see one that said Grandma Plaintiff? 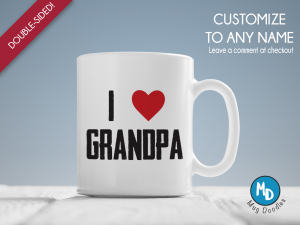 It’s only appropriate that the first advertisement from mugDoodles be one that says I HEART GRANDPA!